Here's why financial independence doesn't mean free time forever. VICKI ROBIN: Well, 'Your Money or Your Life' has a long history. It's not just "a couple of people had a good idea and decided to be famous and write a book." Joe developed the program — Joe Dominguez, my co-author — developed the program in Your Money or Your Life in the 1960s, so that was a decade in development, and it was only for himself, only for his own early retirement. He just felt like financial service was like military service: you get through it because the real stuff of life is through the other door, the door out of wage slavery or paid employment. I met Joe after he had become financially independent. He had some savings, he explained what he had done, and it made a lot of sense to me for a very different reason from him. For me I was a recent college graduate and I'd started on a professional track. I graduated from Brown University, I had lots of good prospects, but it just didn't make any sense to me to sell all my intelligence, time, creativity, to narrow that focus down to somebody else's agenda. I wanted to be free honestly, and well I was in my 20s—and we understand that, don't we? And so I applied his tools, and it freed me up to have a minimum income but be able to have maximum adventure. So fast forward, in the early 1980s, people began to be interested in like, why was Joe financially independent? Why was I not having to work when they had to go "back" to work? They'd meet us on their vacation and they'd go back to work. "Why do we have to go back?" And so he started to develop a, "first I did this, then I did that, then I did that." So he developed what has become the holy writ of the nine-step program, but it was just really him describing his own process. Over the 1980s, we produced live seminars and then a tape course so that word could get out, this approach to money. Number one, if we define financial independence as the process of liberating your mind and liberating yourself from debt and developing savings, this – everybody needs to be on this path. It's a self-preservation path. So I'm not talking about freeing your time forever, "pulling the trigger," as they say in the FIRE movement, and getting financially independent. As a matter of fact, that becomes a problem for a lot of people because they don't know what to do with their time. It's an identity crisis. You know, suddenly your boss or your profession or your context is not defining how you spend the hours of your day. You're free! Oh dear! Now you have to do it. So I don't think that's the ultimate goal. As a matter of fact, I distinguish between work, job, income and identity. Those are four things that all go in the category of 'job'. So if you haven't thought about who am I, what is my work in life, apart from like, my job is what I do for money, but your work is more of a social role or a spiritual calling, you know? Your work is — everybody's work is to be a good person, boom. That's a basic assignment. We all got that one, you know, to be a moral human being. That takes work. Self-education takes work. So I would hope that people start to think about that, that somebody who's a family man and he has a sort of pay grade job gets out of debt, realizes that money doesn't buy happiness, invests a lot in being with his grand-kids. That's somebody who is becoming financially independent, in my book. So that's one part of it, is that we have to stop thinking about some la-la land thing where we're going to get out of everything, because we don't want to! We will be working until the day we die. Granny is going to be like, you know, helping out with the grand-kids. And work is actually what we love to do. We love to belong and we love to make a contribution, and we love to be appreciated for the gifts that we bring. That is a lifelong task. So I just wanted to say that, that the financial independence path really is freeing up your life from debt and from the obsessive desire, obsessive materialism. So there are certain things—one is, I'm not saying everybody should pull the trigger and free up their time to have an identity crisis and an existential angst about "What do I do with my time?!" Because it's a process of freeing yourself. This combination of values and dreams and dollars and cents in a very pedestrian way, and a sort of a decloaking of the dynamics of the consumer culture, so people can see that the things they think they want are very often ideas that have are planted in their heads. We're not giving people back their lives. They read the book, they get onto this program and they just like go, "I'm taking it. I'm going to take my life back, because this game is not worth the candle. This is not equal to who I really am. This is not a noble path and I am going to change." So, long history, but it came out of just one guy, you know. When he was 12 years old at PS 81 in New York City he had to write an essay about "What do you want to be when you're 30?" He said, "Financially independent." 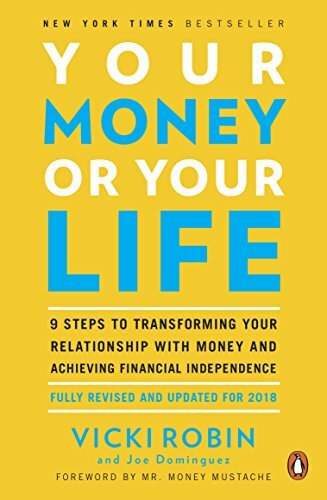 Vicki Robin and Joe Dominguez coauthored Your Money or Your Life in 1992, a now-classic finance book about liberating yourself from debt, waking up to obsessive materialism, and learning to be financially self-sufficient. Anyone interested in becoming financially independent and retiring early needs to ask one big question first: Who are you without your job? What would you do with your life if income were not the focus? The biggest myth? Retiring is not the end of work; it's only the end of your job. It is not free time forever. Vicki Robin warns that people who don't know what to do with their time may be headed for an identity crisis.